alexcc: It's a shame, the new update hasn't fixed my stats, as that's the only thing i wanted from this update... Will give it a factory reset tomorrow just to be sure. wouldnt stability be more important than stats? considering if it isnt stable, your stats are moot. The router performs perfectly fine as a modem if you strip away everything else by bridging it. Since I had it bridged, none of the other issues affected me. ah. my assumption was that your not bridging it. I'm guessing that you can turn off DHCP on the VSDL Router and just use your WiFi Router, in my case my NetGear ADSL2+ Wireless N-300 Router acting as a WiFi repeater. SiFFiN420: Posted On Slingshot' Facebook wall and advised them of my I.T background which includes Microsoft Certifications. He asked me for my email address and gave me the online helpdesk link to some of their broadband related files. I directly linked the firmware update as I didn't want to expose anything unrelated to you all. I have successfully updated from v28 to v32 now. Only one bug noticed was that sometimes turning of the router breaks DHCP on the router and also WiFi. Only way to fix is to turn off and put a pin in the reset hole, otherwise you will have to manually set each WiFi or LAN adapter with its own unique IP address, for example 192.168.1.2, with the default gateway being 192.168.1.1, subnet mask should auto populate. However hard resetting seems to be the best solution till these 2 bugs are fixed, as DHCP automatically assigns each device a IP address on the correct scope with the correct subnet mask. If you see in cmd using ipconfig /all showing the incorrect IP address scope and the default gateway blank you know it's bugged out and you will need to do one of the 2 things I suggested. You're brave trusting thing thing with DHCP haha, I never stopped having issues, so have mine bridged to an actually capable router. It seems fine and pretty solid when just acting as a modem, but you ask it to do too much and you just get loads of issues. Funny thing is, I found the page you're talking about just before I read this post, a few pdfs and the VDSL firmware update. I was thinking on bridging to to my DLINK WiFi Router, same idea as you before I figured out how to fix it. As long as its hard reset the VDSL Router assigns DHCP every time with out fail, no drop off the WiFi. v28 of the firmware I observed drop off's from the WiFi constantly and it going from 3 to 4 bars to 1 bar or no bars, so firmware v32 has definitely addressed this WiFi issue, so bridging is only one solution if you don't want to 1) assign manually IP Addresses, 2) Hard reset the device. Obviously option 3) is to bridge the router to a WiFi Router and have the VDSL Router hooked in via LAN cable to the WiFi router and then broadcast WiFi from there. In saying that the bridging idea adds an extra layer of security to your home network. I might go see my old lady and get my WiFi Router back off her and do the same as the WiFi router properly has better range than this particular VDSL router. The guy at Slingshot said that VDSL hasn't been out that long and that theres going to be issues/bugs with this router at first till they iron them out with sequence firmware updates. For now stability is definitely improved, no more drop off the internet and WiFi has been drastically improved. If anyone notices any issues that keep happening or something definitely not right, PM me asap and I'll will report back to Chris about the issues so the Dev team can fix them on future firmware updates. do be aware, reboots of your dsl connection, can result in loosing the faster profiles on VDSL, due to the DLM calculations considering your line to be unstable. Still going good since the upgrade. NZCrusader: Still going good since the upgrade. as said before, i suspect your modem is still missreporting the attenuation. Since the new firmware I've had a big improvement with my wireless performance however, sync speed has dropped from 52000kbs to 35000kbs & ping times are on average about 10ms higher. The VB104W is now reporting a interleave depth of 1500 - before firmware update it was 1! My actual speeds were at 48 - 49 Mb/s now 25 - 30 Mb/s (I used to get a consistent 20 Mb/s on ADSL2+). I can see the roadside cabinet sitting right outside my house so I believe my connection should be performing the way it did during the first month of VDSL...what is going on? lobster2: Since the new firmware I've had a big improvement with my wireless performance however, sync speed has dropped from 52000kbs to 35000kbs & ping times are on average about 10ms higher. The VB104W is now reporting a interleave depth of 1500 - before firmware update it was 1! what you are experiencing is a DLM profile change, mostly likely caused by your modem restarting so often. My modem is seldom restarted and from what I understood DLM is in effect for first 10 days - is this incorrect, Is DLM ongoing? This drop happened more than a month after VDSL was connected. lobster2: My modem is seldom restarted and from what I understood DLM is in effect for first 10 days - is this incorrect, Is DLM ongoing? This drop happened more than a month after VDSL was connected. Dlm is always on vdsl. This is designed so it trains best for your line, and keeps an eye on it to see if changes need to be made. Remember, nothing is constant in copper. As more jump on vdsl, crosstalk will get worse. I get between 30 - 33Mb/s Down and 8 - 10Mb/s Up, yet my ADSL2+ gives me 13.75Mb/s down, x3 = 41.25Mb/s, I'm curious to see if I could have gotten this speed before the firmware upgrade? The Chorus guy used his own equipment and it was showing 33Mb/s Down and 10Mb/s Up, still pretty good though. One issue with the router and the current firmware is that WiFi or the connection seems to hang from time to time, maybe 3 times a day, I would hate to be playing The Elder Scrolls Online during a dungeon and have this happen. I will contact my Slingshot contact and get him to pass some of this feedback on to the Firmwares developers! SiFFiN420: I get between 30 - 33Mb/s Down and 8 - 10Mb/s Up, yet my ADSL2+ gives me 13.75Mb/s down, x3 = 41.25Mb/s, I'm curious to see if I could have gotten this speed before the firmware upgrade? The Chorus guy used his own equipment and it was showing 33Mb/s Down and 10Mb/s Up, still pretty good though. One issue with the router and the current firmware is that WiFi or the connection seems to hang from time to time, maybe 3 times a day, I would hate to be playing The Elder Scrolls Online during a dungeon and have this happen. I will contact my Slingshot contact and get him to pass some of this feedback on to the Firmwares developers! why do you expect x3 the speed of your adsl? as i mentioned earlier, its a low end cheap modem, you cant expect the world out of it. I understand its a cheap low end modem, and I'm happy with my new speeds. When I come into some more money I will splurge on a decent router, until then I'm quite content with it. The WiFi dropping out issue isn't an issue with WiFi, its the connection hanging, this is properly due to the cheap router/modem I have. SiFFiN420: I understand its a cheap low end modem, and I'm happy with my new speeds. When I come into some more money I will splurge on a decent router, until then I'm quite content with it. 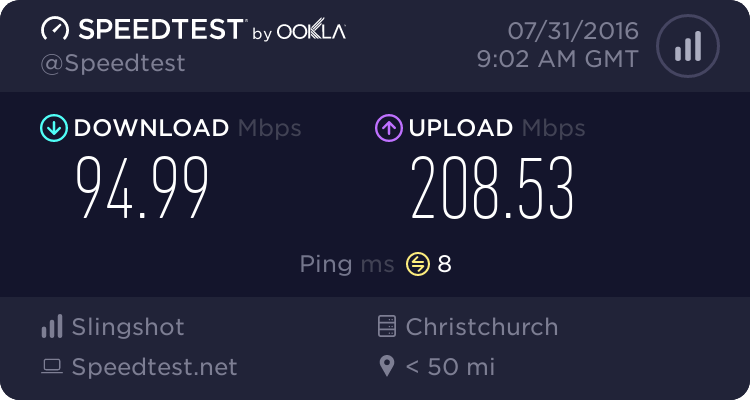 If you've still got your ADSL2+ router, you can connect it to the VDSL router and use it as an AP. I found the Slingshot provided wireless ADSL router was much more stable with wireless than the VDSL one. - That's what I did temporary before getting my asus. I have a NETGEAR Wireless-N 300 Modem Router DGN2200 but I was unable to quickly figure out how to make it work. I plugged in the VDSL into the Netgear, but the Netgear doesn't detect the VDSL router being plugged into it. So not sure without sitting down with a few hours how to get this to work. Any help would be appreciated. Disable DHCP, UPnP and the firewall on the AP, and give it an unused IP in the same subnet as the VDSL router. For instance I gave mine 192.168.1.50, VDSL router had it's default 192.168.1.1. Enable wireless and configure your wireless security, then unplug the AP from your computer and plug it into a spare Lan port of the VDSL one.